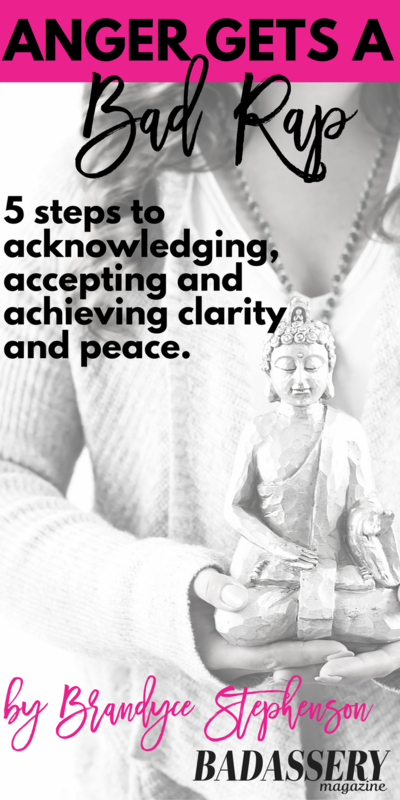 Five steps to acknowledging, accepting and achieving clarity and peace. Anger gets a bad rap. It’s not a pleasant emotion we are told. Anger is just a form of fear. In fact, anger is such a prevalent social issue we have management classes around it. Happy, Sad, Anger, Joy, Guilt, Lonely, Empty, Despair, Content, Discontent, Anxious, Worried, Stressed, Free, Alive, Cheerful, Powerless, Confident, Worthy, Elated, Bored, Doubtful, Hurt, Courageous, Satisfied, Lucky. This is by no means an exhaustive list — more feelings can be found here Psych Page Feelings List . A few weeks back, I found myself really angry — borderline rageful. I had not been this angry in quite some time and it was actually disconcerting for a moment. Just the amount of anger I felt, made me uncomfortable. I had received an email from someone that was full of “understanding.” However, that “understanding” was wrapped in passive-aggressive language. You know the kind. Or if you don’t, lucky you because passive aggressive emails are the worst. The type of email that just makes you want to puke or call the other person up and tell them exactly what they were trying to say. I actually couldn’t finish reading it in one sitting. I had to come back. In the end, it was as if I had been invited to a fight I wasn’t aware I was in! When I closed the email before I finished it, I realized I needed to get to a clearer state of being. I needed to get down to the cause of why this email had brought up such strong emotion. What was this [anger] really about? This pause led me to what I know is next right thing to do for me. As someone who meditates daily, and is pretty laid back (and has recovered from anger being the answer) I turned to my meditation pillow. Meditation pillow. Sit. Breathe. Be still. Ra Ma Da. Listen to the mantra. Healing. As the mantra plays, I offer up the anger. Allow me to see this differently. Deep breath in – and let it all go. And then it comes…The answer. Being hurt is different than being angry. Hurt takes longer to heal from, especially if it’s from someone close to you. I once heard from Dr. Phil that anger is really just a form of fear. In this case, that holds absolutely true. I was afraid — that I would lose something I had, or not get something I wanted. This fear came through as anger, and when I was able to take a step back, I could see that fear was actually hurt. I was hurt that the person in the email had misunderstood a situation that had happened. I was hurt because there was a lack of understanding. I was hurt that the person was, in my opinion, taking things to a level that was unnecessary. A phone call probably could have saved a lot of time — and emotions, on both sides. The other important part of understanding what was driving the anger is the opportunity to pause when I am aggravated. The spiritual thug in me had all sorts of sassy responses. All sorts of explanations about how wrong they were and how right I am. I didn’t say I was perfect, I am human, remember? When I pause I am allowed the space to respond, rather than react. I wrote my sassy responses, cleared them from my mind so I could move on and they are safely in a draft file, to be deleted in the near future. I have learned to never respond when angry, things get said, that you may not be able to take back. It’s wise to never send emails, make phone calls, decisions, or anything else that could have lasting consequences when you are angry. Anger is an emotion that we are going to have. It is part of living life, part of being apart of this great, big, wide world. It’s OK to be angry. It’s OK to feel the emotion. When we try to deny it or hide from it — that’s where the trouble lies. Being in touch with our anger, and what is really underneath is the key to mastering it — as opposed to it mastering us. Next time you find yourself angry follow these 5 steps and bring yourself to a calmer state, find some perspective, and move through it. Pause. As soon as you feel the anger come up, take a step back and pause. Most things in life, rarely require an immediate response. Take a break (if you can, for instance, if at work, excuse yourself) and don’t react. Reflect. Ask yourself — why am I so angry? What is this about? Why am I being triggered? Really think about the situation, and what could be coming up for you. It’s likely you’ll gain some perspective. Ask for help. Perhaps you send up a quick prayer to a higher power, such as above or phone a trusted friend — sometimes a different perspective can help or just a quick vent sesh. Point is to not let it roll around for long in your head. If you have a meditation practice, use it. Sit quietly or with a mantra that serves you and ask for the anger to be released. Ask for clarity and for the feeling to be relieved. I have a great 5-Minute Meditation you can use. Write it out. If someone sent you an email or even a meeting or phone call, you have things you may have wanted to say. Say them — just not to the person. Just like asking for help — getting your thoughts down on paper or a Google Doc, allows for a shift in perception. You may start to see why you are really angry or re-occurring patterns. Writing is extremely therapeutic, it’s gets it out of your head, so you can move on. Be kind to yourself. Give yourself a break. No need to be ashamed of being angry, it’s a natural human emotion. It truly does allow us to come to greater understanding of ourselves and others. Adding shame or guilt to the mix is unnecessary — we don’t need to order a triple shot of negativity and drink it down. If you are in a situation that requires a response, then working these five steps can allow you to respond as oppose to react, and form a clearer and calmer state of mind. If you don’t need to respond, then these steps will help you to work through the cause of why you are angry, and hopefully gain some knowledge about yourself. I hope these five steps serve you and help you to understand that anger is not a “bad” emotion or something to run away from. It is simply a part of being human and if we allow it — can teach us and provide us valuable information. Brandyce Stephenson is a speaker, meditation teacher and spiritual badass helping men and women blend reality with spirituality, feel more centered and connected so they can live life freely. Having woken up one day realizing there must be more to life than sitting under fluorescent lights, she set out on a mission to help others rise to their full potential and create more meaning for their lives and work. She’s a proud alumni of Spirit Junkie Masterclass Level 1 & 2 led by Gabby Bernstein. When not dropping good vibes all over the internet, you can find her plotting her next trip, baking up something delicious or meditating to Aerosmith (true story). Find her and her adventures at: Facebook, Instagram, Web, Twitter and Pinterest. Brandyce Stephenson is a transformational life coach, meditation teacher, speaker, and founder of B. Soulworks, helping men and women get clear on the life they desire, to create change that results in dramatic transformation for a life of absolute freedom. After a successful marketing and events career spanning over a decade, Brandyce woke up one day realizing there must be more to life than sitting under fluorescent lights, and answered the call to find out what that is. She has made it her mission to make sure that no one ever feels stuck in a life they aren’t 100% in love with. She has studied with New York Times best-selling author and speaker, Gabrielle Bernstein and is a proud alumni of Spirit Junkie Masterclass Level 1 & 2 and with New York Times best-selling author and meditation teacher, Sharon Salzberg. When not dropping good vibes all over the internet, you can find her plotting her next trip, creating up something delicious in the kitchen or meditating to Aerosmith (true story). Find her and her adventures at: Facebook, Instagram, Web, Twitter and Pinterest.